First of all, lets be honest with ourselves and not try to compare our suffering to Christ’s suffering. There isn’t enough strife in all of us combined to tip the scale of what Jesus went though for us. 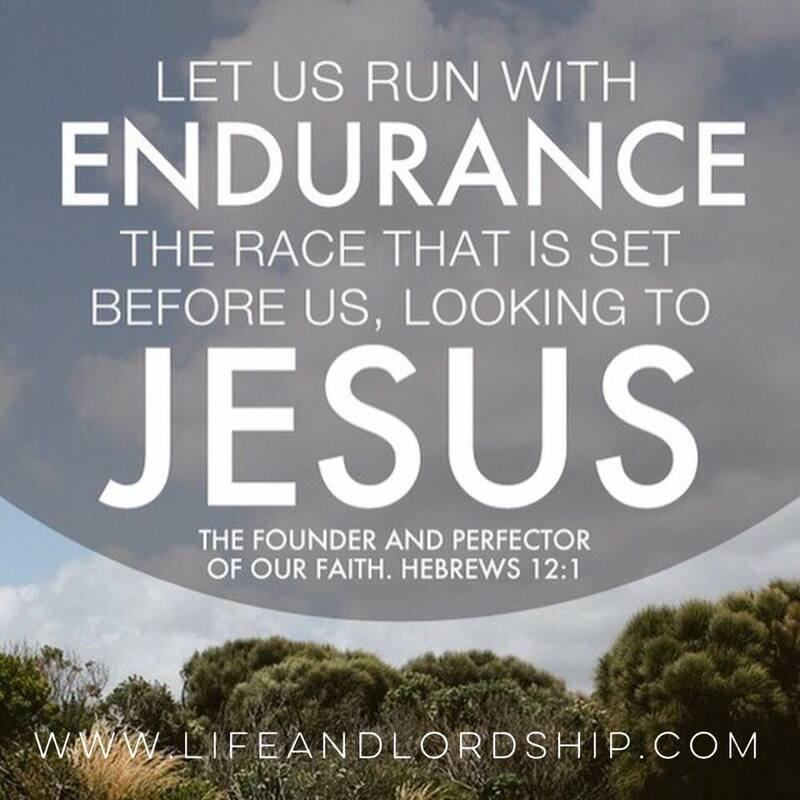 However, the concept applies – “let us run with endurance the race that is set before us, LOOKING TO JESUS.” He set the groundwork for us to faithfully endure this “race” of life in all of it’s temptations and hardships. The instruction leads us to find joy in our suffering, or at the very least, joy in the outcome, namely an eternity with Him. Is it possible that what “perfected our faith” was Jesus’ joy in his endurance, motivating his strength to suffer well? If Scripture is correct, the model He represented can be reflected in our lives, if we simply look to His example. I, for one, hate not being full of joy, and since my troubles are guaranteed to never cease, I think I’m going to take the author up on His suggestion!! I don’t think this verse needs deep explanation, other than pointing out that if we do not have faith that wisdom will definitely not come from the world or your own natural abilities, or full assurance that God is good, we will not “receive anything from the Lord.” We are “double minded,” unsure whether or not God is faithful and capable to give us the wisdom we seek, considering wisdom could come from any other source. So, are you like me, you seek wisdom, but you’re uncertain if your faithometer is at a full 100%? What are you doing about that? 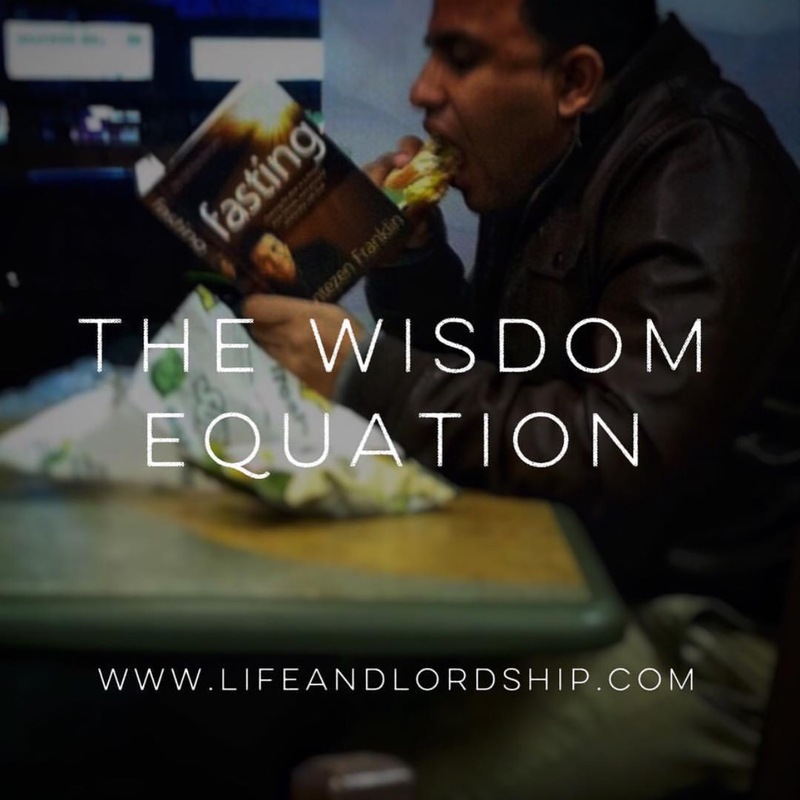 Fasting is certainly a great course of action to grow deeper in relationship with God, and in turn, increase your faith in him and his goodness. Check out the story of Jesus’ disciples NOT being able to heal an epileptic boy, then Jesus comes around and of course heals the boy. They ask Jesus why they couldn’t heal him, and he says “Because of your unbelief; for assuredly, I say to you, if you have faith as a mustard seed, you will say to this mountain, ‘Move from here to there,’ and it will move; and nothing will be impossible for you. However, this kind does not go out except by prayer and FASTING” (Matthew 17:20-21). There it is – This kind (of faith) does not go out EXCEPT by prayer – which we are already doing by means of request – and FASTING – which we are currently considering. In many cases, this is the missing element, and this is something I know I must be doing if I have a hope of attaining the faith needed to come before God with a wisdom request. 3.) ***ask God for wisdom IN (now assured) FAITH, and it will be given to you. Prayer + Fasting = Faith. Wisdom request + Faith = Wisdom!!! A transformed outlook, a broken and enlarged heart, an invigorated passion, a holy rage, a widened vision, an enriched purpose, a deepened desperation, engrained relationships, a changed life. When considering a missions trip, your thoughts could include assumptions that you’re going to transform a culture, that God is going to do a great work through you to impact a people group. Though these are both possible of many outcomes, the most prevalent take away of a trip I recently took to the middle of Haiti was the transformation and great work He did inside of me. Having received an invitation to take a trip to serve an organization in Port Au Prince, I immediately accepted because I’ve heard of how things like this can deepen your faith and your appreciation for your life back home. I had never heard much about Haiti, but knew it was a desolate, third-world nation. I really didn’t know what to expect, but I was definitely down for an adventure. After our initial arrival, we visited a nine-orphan home that is set up by the organization we partnered with there. We were able to see who they were, and that they were clearly well taken care of by the team in place at that location. Right away, our comfort zone/personal space bubble was popped as these kids’ faces lit up and ran to us with arms straight out to grab and hold us, or arms straight up in petition to be held by us. We were told that in the next few days we would visit the orphanage that they came from, and witness the desperate conditions there. The next morning, we went to one of the poorest and most dangerous parts of the western hemisphere – Cité Soleil. 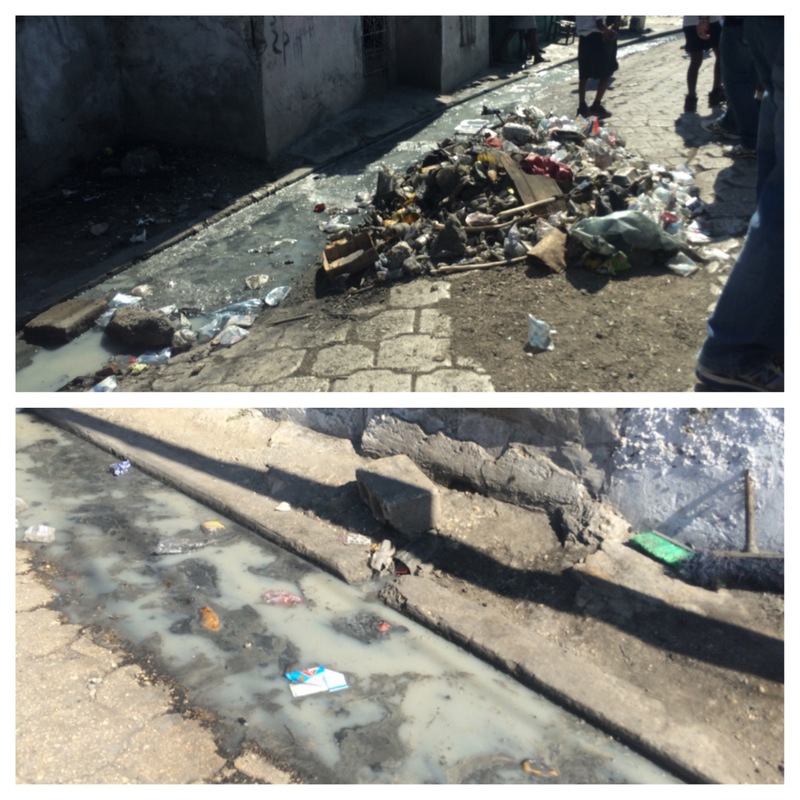 The area has been called a “microcosm of all the ills in Haitian society: endemic unemployment, illiteracy, non-existent public services, unsanitary conditions, rampant crime and armed violences.” It’s a place that should an American get into trouble, I’m told that the U.N. will not come rescue you. My heart was broken before our van was put in park as I saw little boys running around with barely any clothing, and what clothes they had were torn and battered. Some of them had only a small shirt, no pants, and nothing on their feet. Still, they had huge smiles on their faces. I saw joy in the eyes of the hopeless. We got out and began to walk with our Haitian guides. The chaos and devastation of the landscape seems to never end the more you walk. The smell there is one similar to a portable bathroom at a race track or baseball field; there is no plumbing system, so the street curbs are lined with rivers of sewage. There is no garbage pick up, so garbage is absolutely everywhere, and best attempts are made to pile up and burn it. Aside from putrid breathing conditions, the living quarters are boxes with tin roofs, and, if you’re lucky, a cloth as a front door. The food supply is in high demand, demonstrated by the bodily evidences of malnutrition and the mudpies we were shown – made literally out of dirt, eaten literally just to feel full. Again, just like at the orphan home the night before, these kids who have zero hope come running up to you, in almost overpowering numbers, to simply hold your hand and walk with you, get their picture taken with you, have an ounce of your attention directed toward them. We stopped to talk with some people, and a mother tried to give her child to us, to give it a better life. That was the peak, that was what finalized our view of how depressed this city was. At one point, our guides interpreted signals from local gang members that it was time to leave, right then. We hopped in the vans and went to the next destination – the orphanage our guides obtained their kids from. At first onset, it didn’t seem too bad compared to the rest of the things we saw that day. There were about 20-25 kids in an upstairs area. We spoke with them (through interpretation), played with and held them as much as they wanted. Our guides took groups of six of us at a time down to the basement; there was something they wanted us to see. It was my turn. I was lead down some stairs to a hallway where they first told us about a cooking area, but said it never gets used to cook food for the children the building hosts. We walked next into a very dark, dungeon-type room. I’ll never forget the things I saw and heard described to me after I walked inside. At night, the small room is packed full of infants to small children, boys and girls. The guide told me that when she first came there, there were babies laying in human feces and urine, and basically the most unsanitary, ungodly conditions you’ve never dreamed of. I was too broken to even speak. The guides said that they are actively involved in processes to get this place shut down. This entire day was spent peeling back the veil off of our eyes to witness the depths of depravity in this country. It didn’t get any worse than this. We ended this day with a wealth of emotions and thoughts ranging from guilt to confusion to helplessness to anger to sadness… to facedown prayer. The majority of our next day was spent at an after-school program that kids flock to. We were able to speak to them about dream pursuit and Christ’s love, then spent time loving on them in whatever way they wanted most, be it games or hugs. As dusk approached, we took a walk through the worst housing I’ve ever seen. Their kitchen, laundry room, sleeping area, everything was within a 10’x10’ area in some houses. We had the privilege of praying over a couple of people that requested it for their sick children, for their frail bodies, for their salvation. We ended this day with an escalated hope more so than the day prior. There are things and programs in place for people to better themselves and excel in their country’s economy all in the name and for the glory of Christ. We ended that night on the roof of the house reflecting on everything we had seen and singing worship to God. We have all seen commercials and pictures of places like this before, but it really can’t grasp your attention like being there to see, smell, feel, and hear what is actually happening. We genuinely do not have a clue. And how could we? Media will never seriously cover it, celebrities will never bring attention to it, and our couches and cozy homes and living will never allow it to cross our minds lest we grow a holy discomfort. Public officials attach the term “poverty” to American neighborhoods because they have no access to internet. American animal abuse rescue organizations advertise moving pictures of puppies in cages with Sarah McLachlan playing in the background to convince you of the priority of their mission field. As I write this, someone is reading an article about Kim and Kanye two rows ahead of me on my flight… I’m sure it’s important. Little do we know over here that in other lands, poverty is a word to describe someone who is about to die. Little do we know that animals there are sleeping in rivers of human waste. If you had seen what I’ve seen, you’d want to first class ship politicians to the slums. You’d want to burn down the organizations that elevate the mission field of American animals above Haitian humans. We are over occupied with things that don’t matter and carry no eternal value in this country. Haiti is a place that wrecks your American comfort to pieces. You return feeling like, why do I deserve to drive this fancy truck home? What makes me greater than them that I can stop at any fast food place or starbucks I want on the way? 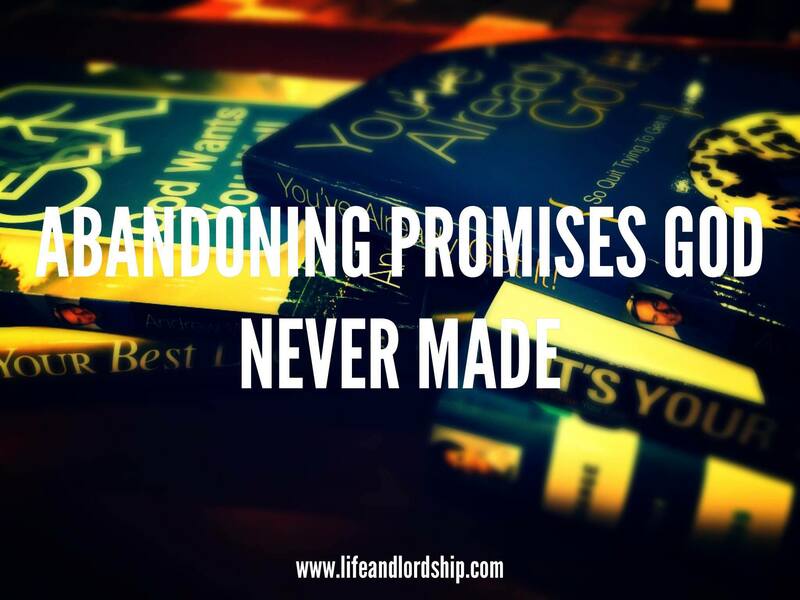 What makes me so much better than the orphaned that my parents never abandoned me? It’s difficult to find my place in a culture that finds discontent and entitlement in having everything after spending time in another that finds hope and joy in having nothing. When I was little, my mom would always tell me when I was discontent with a food or toy that I should go over seas where children have nothing so I would appreciate what I have more. Is that the case now? No, I’m actually MORE discontent, but in a different way. Everything I have here tries to keep me from being hopeless, and it rarely works. What I’ve realized is all the things I’m told I should be so much more grateful for are actually barriers to me placing my hope and security in Christ. I so easily love these things, and they never fully satisfy. Haitians have nothing else to place their hope in, so Christ is easily within their sights as their only hope. I envy that desperation. This is not a petition or plea to increase your gratitude for your home, family, and life. This is a call to action for the cause of Christ. God never created us to prize comfort, but we do. We ignore the uncomfortable truths to evade guilt so we feel fine doing nothing. We even go as far as creating theologies to justify comfort-seeking as a direct fruit of faith. To truly worship God is to love what he loves, and he loves the broken. We’re swift to direct our attention to material things, as they have limited food, water, clothing. While those are very real needs, they are not the primary need. They just want to be loved and held!! Their primary desire is for people to care about them, their primary seek is a source of hope. They already know that “man shall not live on bread alone,” and they need someone to come in and tell them “but by every word that comes from the mouth of God,” or HOPE. We can not claim to be dedicated to laying down our lives and making people eternally glad if we are not caring about world missions. We can not love people or love God without doing both. We MUST champion the orphan if we claim to love the broken. We MUST cry over the living conditions if we claim to help the hurting. We MUST walk ghetto streets and smell the atmosphere of human waste and hold the hands of the diseased and kiss the foreheads of the unbathed and pick up and hold the young unclothed if we claim to be a representative of Jesus. Because He did. That scripture refers to the worldly pleasure we exchange for suffering and worldly abstention to pursue Christ to the ends of the age. If He did not resurrect, and we do not have His hope of eternal pleasure, hope, and satisfaction, then by all means, chase after and absorb every comfort this life has to offer, because it’s the only life we will ever have. But if He DID rise, and we DO have eternal life and hope, the comforts of this world will fall so far subordinate to the joy of living a life in full surrender God – which leads to a heart aligning with his purposes and passions, including passion for the broken. 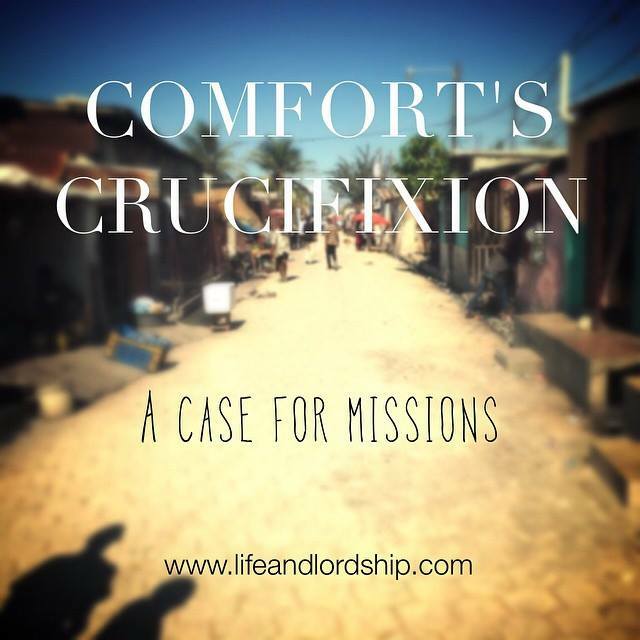 What this all means in light of mission work is that to have a Christ centered passion for missions is certain to deliver greater joy and comfort than to have no passion for missions. The work of spreading the gospel, making disciples, and loving the broken does not exclude your home town. God has you where you are right now for a specific reason and purpose. The reason there is such a focus on foreign nations is exposure and poverty. To not hear of Jesus Christ at least 100 times in an American lifetime is to seriously be living in a bubble. We have tv shows, radio stations, and churches on every corner. Think of it this way: What seems more reasonable? 50 people changing 1 lightbulb, or 1 person changing 50 lightbulbs? Haiti is roughly the size of Vermont; Vermont’s population is 600,000, Haiti’s is 10.3 million. On top of that statistic, Vermont has the same amount of total human beings as Haiti has orphans. Thats right, there are 600,000 orphans in the nation of Haiti. I use this place as an example, but there are plenty of other countries that are in similar conditions such as Thailand, Tanzania, Indonesia, and much more that are ripe for the harvest. There is no doubt that missions care is a mandatory part of the Christian’s heart, but perhaps you don’t yet feel the calling to go. Thats ok. But at the very least, send. There are tons of people who are diving in to this thing head first, and the only obstacle they encounter is financial fuel. There are organizations like the one I am partnered with called I’m ME. They are stationed in Haiti and are making large, exponentially growing waves in the community there. They are rescuing kids from deadly situations, creating opportunities for self-advancement, loving on people and being Jesus to those He came to save. Their success, however, is determined largely by God moving many people’s hearts to contribute resources to their cause. I encourage you to check out their web site, see what they are about, and pray about supporting them and/or other Christ centered missions organizations. Where you spend your wallet, you spend your heart. The world tells us that we are free to live comfortably. God’s gospel tells us we are free to crucify our comfort. In doing so, we will have effectively torn down the wall that blocks our direct view of God as the all satisfying source of hope. For me, I am stunned. I’m stopped in my tracks. I went to Haiti to serve others and be an asset for change, but Haiti changed me. I’m not sure I’ve ever had a greater sense of purpose than I do right now. I am so charged up and craving the Lord to pave my way for future endeavors. Are you craving purpose? Want to be a part of a war that is sure to be victorious? God’s global missions purpose WILL stand (Matthew 24:14), he “WILL accomplish all <His> purposes (Isaiah 46:10), He WILL enlarge the hearts of those that go to deny their needs and wants, and He WILL fill them with a joy that will last far beyond the limits of this life. I’ve read through the book of Romans before. Maybe even twice. But reading it today, I wonder if I completely skipped over the verse above, or maybe that page was torn out, because if I had truly read and understood it, so much of my life’s ministry would have been different. Found an interesting piece of literature a few weeks ago. It was a letter I wrote someone, another Christian, about 3 years ago, that I’m not even sure they received. As I read through it, I could visualize myself in the room writing it. With every passing paragraph, I wanted to strangle my own neck. I told this person I was disappointed in them, that I wasn’t so sure I wanted to be connected with someone that acted like such and such, suggested that their love for God was diminished because of so and so, I even had the balls to tell them “I would never even think of doing that,” as if I was the standard for the Christian life. It was a letter polluted with pride but covered with a form of Godliness. What I mean by that is I was judging the crap out of this person, but doing it in a way that seemed like I was just looking out for their best interests. I wasn’t though; I was looking out for MY best interests. What would never be admitted then was I was hungry for attention and affirmation of the amazing, wise Godly man I was. I fabricated a way to crush this person to further elevate myself with MY knowledge, with MY purity, with MY righteousness. Like drowning in a pool, I was pushing someone down to make myself higher. Is homosexuality and abortion wrong? Yep. Is drunkenness wrong? Yep. But so is the lying, deceiving, lustful, covetous parts of my heart that Jesus died to redeem. I somehow made God’s law and wrath the focus of my life’s ministry, and left out Jesus’ fatal act of saving the world from their sins. It was all rules and regulation without the love and compassion. What I believe is right and not only are you wrong but you must not love Jesus enough. I will always have a log in my eye, and that’s the point. I’m indefinitely imperfect, and therefore, an unqualified judge. The proverb below pierced me right through the heart. Never did I desire to hear someone out and just be a loving ear, I wanted to tell them that regardless of their circumstances, they violated this, this, and this. And a fool, I most certainly was. Am I so bold as to claim that I doubtlessly know the mind of God enough to point my finger at any person? God’s primary concern is not rules, but people… people that we are not to judge by rule but to love by grace. “It is before his own master that he stands or falls,” NOT ME. I, nor the way I see scripture, do NOT have the final say on someone’s heaven acceptance. My viewpoint is not sitting on the Throne. I’m faulty, I’m frail, my opinions change, my heart changes. Even if I was appointed to be Judge, I’ll never be in any solid condition to play the role. Our responsibility is to love. When society deems us hateful and judgmental as a whole, we have it wrong. The gospel is a controversial message, no doubt, but it’s a message that should give the church the display of love, servitude, and humility. OF COURSE people know how screwed up they are, do we really need to beat them over the head with it? Productively speaking, that’s crazy. Instead, we are to “Let all that we do be done in love” (1 Cor 13:4-8). We are to walk alongside people, “become all things to all people so that by all means some might be saved” (1 Cor 9:22). Some feel we are to judge the sins of a nation or a culture that rejects us, but who are we to say that WE ought to be owed some sort of respect and dignity when this world isn’t ours? We are visitors here, ambassadors of another colony. We are representatives only. We are not sent here with the sole objective to change law and policy, but to reflect the love of the God who came to save this world. We don’t go to third world nations to judge the sins and ways of a people who don’t know Christ, we go to LOVE in any way we possibly can!! So why do we do it here? Because we consider America our home and want to worship as comfortably as possible? That’s not our calling. I read a book that told me that I would be persecuted for my beliefs, not catered to and called a dignified human being. All this is to say that our responsibility is not so much to judge a person or a sinful culture that we’re not a part of, as it is to love them unconditionally so that people can catch a glimpse of what this Jesus is we talk so highly of. I want to show the world the love he gave to me, not the judgment he freed me from… pedestal kicked aside. Failure can be described as not coming through on an assigned task, or falling short of expectations from a higher authority or self. That’s what I feel today as I learned of a death in the community while I was making a stop at my local parts shop. I was stunned. This dude was 36 years old. He was healthy, I always saw him at the gym. For all I know, he wasn’t in to drugs, heavy drinking, or terrible eating. He, very simply, was alive one minute, and dead the next. They found him in his chair in his house with the tv still on, and expect he had been there for a few days. I don’t know why it happened, but if I did it really wouldn’t change anything. I did not know this man too well, but being a landscaper, we did know each other. He was the guy from Classic Cut, I was the guy from Creekside. We talked countless times at the gym during the winters and joked about how we’re trying to stay in shape so we can be ready to tackle landscaping season, as well as the traditional crap we deal with with customers. We’d bump into eachother at the store I was at today and share a quick laugh. We would pass each other on the road 2, maybe 3 times a week, and we would wave. Also, his house was less than 1000 feet from mine. And never ONCE did I share the gospel. Never once did I speak of the Jesus I love so dear and claim to be saved from my sin by. Never once did it cross my mind that he may not know Christ and I could be the only one in his life to introduce him. I wonder if he even knew I was a Christian. Not only did our conversations exclude the most important thing to be discussed, but I’m certain I probably entertained foul talk. You know, manly talk, the talk that we feel justified to have as men, even if we’re Christians, because, well, we’re men and thats just the way it is. Right? I can recall praying in church “God, if you put someone in my path that you want me to witness to, I’ll do it!” I don’t know if I expected a post it note on someones forehead reading “witness to me” because there was a man that lived 15 seconds from me, was in my field of work, shopped at the same stores as me, lifted the same weights at the same time as me, and my witness was silent. How pathetic. What do you do when your favorite sports team wins? Keep it to yourself? Dale Earnhardt Jr. (my favorite driver) just won the Daytona 500 (my favorite race). I must have texted 20 of my bros about how pumped I was about this good news. We don’t share this truth about Jesus taking our sin and giving us His righteousness because it’s our duty, we share because we are OVERJOYED and can’t find the ability within ourselves to silence our mouths about it. In fact, our joy is not made complete until we have brought other people to enjoy it with us, just as I did with the race. When people die, our natural inclination is to always selfishly think of ourselves and how fragile OUR lives are. How often do we think and give a care about how short the lives could be of the people around us? What is their eternal destiny? We don’t have to travel halfway across the world to access a mission base. We’ve got people to love to life in our own backyard. If God works through people to awaken the hearts of other people, then we are responsible for what it looks like. The fruit displays the root. If there is no fruit (evidence) of salvation, we’ve really got no business telling people we’re Christian. Why do we think we can separate our “Christianity” status from our lifestyle? As if one doesn’t hinder or affect the other? As if everything we do doesn’t have eternal consequences for ourselves or others around us? Let’s be honest with ourselves (myself included). If we’re in church on Sunday but bar crawling Saturday night, we’re doing it wrong. If we’re claiming to be saved by Christ, but our mouths don’t evidence it, we’re doing it wrong. If the people we come in contact with don’t see the light of Christ shining from us, WE’RE DOING IT WRONG. Yes, life is fragile. God has a number of how many days you will live, so pursue him and allow him to pursue you with your life, but not just for you. Pursue God with your life by loving and serving others, so that some might be saved. I’m embarrassed by my hypocrisy. I’m angered by my worthless talk and misuse of time. But I’m fueled to hunt down open doors with sharp eyes and take captive every opportunity I’m presented, to live a life that honors Christ so He can work through me and in the lives of others.